Northampton Town have re-signed Wolves defender Daniel Jones on loan for the rest of the season. Jones, who impressed while on loan at Northampton earlier this season, can be recalled by Wolves at 24 hours' notice after 28 days of his new loan deal. 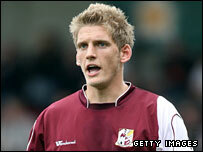 Cobblers boss Stuart Gray said: "Daniel doesn't need any introduction. We know about him and he knows all about us." Meanwhile, Wolves defender Mark Little has extended his loan at Sixfields for a third and final month.